Special thanks to Bayview Hotel Georgetown Penang for extending this hotel review invitation. 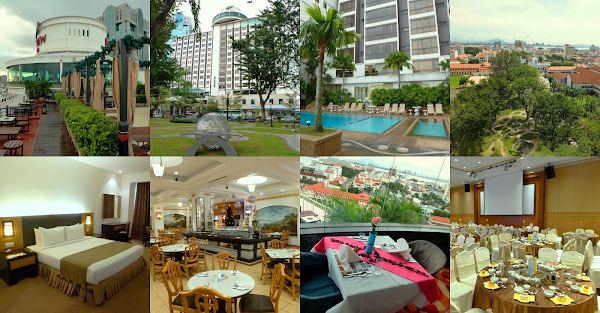 Bayview Hotel Georgetown Penang is a 4-star hotel at Leith Street (Lebuh Leith), George Town. This 340-room hotel has the distinction of having the first, and to this date, sole revolving restaurant in Penang. The lobby of Bayview Hotel is fitted with marble surfaces and wooden fittings. Formerly located at Farquhar Street (Lebuh Farquhar), the lobby was moved here when the hotel launched its new wing. As Christmas is just around the corner, the lobby has been decorated with festive yuletide ornaments. Opened from 10:00am to 12:00am, the hotel's spacious Lobby Lounge serves alcoholic beverages such as draft beer, wine and cocktail. Happy Hours run from 5:00pm to 9:00pm. Each evening starting 7:30pm (except on Sundays), a two-piece band livens the ambience with lounge music. Across the lobby is Maya Tailor & Boutique. This shop specializes in tailored suits; clients can collect their orders within 24 hours. This boutique is a lifesaver during sticky situations. As for recreation for the family, the outdoor swimming pool on Level 4 is flanked by a wading pool as well as a Jaccuzi hot tub. This outdoor area is open between 7:30am and 7:30pm. There are no lifeguards on duty, so children under the age of 15 must be supervised at all times. The fitness center at Level 5 is furnished with a handful of exercise equipment like treadmills, stationary bicycles and weight machines. Drinking water and clean towels are provided for the convenience of guests. The gym is open from 6:00am to 9:00pm and requires keycard access. Bayview Hotel's guestrooms are arranged in three wings. From the Garden Wing, the KOMTAR Tower and most of UNESCO World Heritage Site come into view. Directly in front of Bayview Hotel is Friendship Park, a landscaped public park jointly built by the Penang Island City Council (MBPP) and BSG Property. Bayview Hotel has several room categories to accommodate guests with different needs. This weekend, I am staying in the Premier Grand Deluxe Room. The room is relatively spacious for two persons. Larger room categories can even fit extra beds. Smoking and non-smoking rooms are segregated in separate floors. My room is furnished with a king-size bed, a dressing table, an office desk and a wardrobe. Room amenities include an LCD television with cable channels, a clothes iron, an electronic safe and a minibar. Wi-Fi connection is available throughout the hotel. The ensuite bathroom is furnished with a bathtub with heated water. Bathtub is becoming a rarity in many urban hotels due to the extra space it occupies. Other conveniences in the bathroom are hair dryer, towels and complimentary toiletries. Besides bottled water, each guestroom is equipped with an electric boiler in order to prepare coffee or tea. The minibar is not stocked, but guests can order food from the 24-hour room service menu. Guests who prefer to dine in a proper restaurant can visit Kopi Tiam at the Lobby Level. This halal-certified coffeehouse is open from 6:30am to 1:00am. Breakfast is served at Kopi Tiam from 6:30am to 10:30am. Let's take a brief walkthrough of the breakfast menu. Breakfast cereal is one of the most nutritious foods to start the morning. Corn Flakes, Koko Krunch and Honey Stars are provided, and so is fresh milk. Other healthy choices include oatmeal, muesli and yogurt. There is an egg station where the staff prepares à la minute egg dishes like omelette. Other Western breakfast foods are smoked chicken sausages, hash browns, baked beans and cheddar cheese. Meanwhile, bread & butter pudding is served with vanilla sauce. Sliced bread is available at the pastry section. Bread spreads include jam, marmalade, butter and peanut butter. Other pastries here are croissants, Danish pastries and muffins. Should customers prefer warm bread, the pastry section is equipped with a conveyor toaster and a toaster oven. Nasi Lemak is unofficially Malaysia's national dish. Cooked with coconut milk, the rice is fragrant and tasty on its own. Sambal tumis (chili paste) is an essential ingredient to spice things up. Other Nasi Lemak ingredients are fried fish fillets, fried anchovies, roasted peanuts, hard-boiled eggs and cucumber slices. Roti Canai is another crowd favorite among Malaysians from all walks of life. This Indian-Muslim flatbread is usually eaten with a spicy stew like sardine curry and vegetarian dalca (stew). The noodles section allows guests to cook their favorite noodle like koay teow (粿条), rice vermicelli (米粉) or instant noodle. As for the soup, tom yum (ต้มยำ) and chicken stock are prepared. Optional ingredients are shredded chicken, fish cake, bean sprouts, fried shallots, garlic oil and more. The buffet breakfast also includes a number of vegetarian dishes to cater for guests with dietary restrictions. One such example is Wantan Noodle With Vegetarian Char Siew. This dish is also cooked with choy sum (菜心), cabbage and carrot strips. The salad bar serves ready-made salads such as coleslaw, seafood salad and kidney bean salad. For guests who prefer to mix their own salads, Kopi Tiam prepares fresh vegetables like iceberg lettuce and cherry tomatoes. Salad dressings include Thousand Island dressing, vinaigrette and sesame oil. As for drinks, guests can help themselves with chilled juices from the dispensers. There is also a refreshing bowl of fruit cocktail at the desserts counter. In addition, instant coffee machines dispense caffeine fixes with the push of a button. Next to Kopi Tiam is an open-air section called Secret Alley Café. This eatery serves economy rice (nasi campur) for lunch between 11:00am and 2:30pm. Secret Alley Café is open on weekdays except on public holidays. An elevator to the top floor takes one to the Three Sixtyo Revolving Restaurant & Skybar. This rooftop restaurant operates independently of the hotel. After sunset, the outdoor Skybar is a pleasant place to have a round of drinks while enjoying the cool evening breeze. Three Sixtyo serves Peranakan (Nyonya) buffet for dinner every evening starting 6:30pm. Dining tables are arranged on a ring-shaped floor which makes a full revolution every 45 minutes. This allows diners to get a 360o view of the city skyline without having to leave their seats. The largest venue at Bayview Hotel is Sri Mas Ballroom on Level 4. The hall can accommodate as many as 40 tables in a banquet setting. Immediately outside the ballroom is a spacious cocktail section. Similar to Kopi Tiam, the banquet menu is halal-certified. Bayview Hotel is conveniently located in the heart of George Town, allowing easy access to many tourist attractions like Fort Cornwallis (Kota Cornwallis) and UNESCO World Heritage Site. Would-be guests can make their bookings on the hotel's website to take advantage of exclusive discounts and offers. In Penang, Bayview Hotel Georgetown Penang is one of the two properties under Bayview International Hotels & Resorts; the other is Bayview Beach Resort at Batu Ferringhi. The hotel chain also operates several properties in Kuala Lumpur, Langkawi, Singapore, Australia and New Zealand. Directions: Bayview Hotel is located at Leith Street (Lebuh Leith), between Lebuh Farquhar and Jalan Sultan Ahmad Shah. The hotel provides complimentary parking for in-house guests. The entrance to the multi-storey parking garage is accessible from Lebuh Farquhar.